Buying the best crib mattress is just as important as buying the best baby crib or the best car seat so we have compiled a list of the best baby crib mattresses. Baby mattresses are more than just a sleep surface. It is important to buy the safest crib mattresses since your baby will be spending more than 50% of his or her time sleeping there in the first few years. Below is a list of the best crib mattress 2019 along with the crib mattress reviews. Keep in mind that infants need to sleep on a firm mattress for safety. They need a firm, flat and even sleeping surface to ensure breathability in the crib. Firm mattresses also helps maximize their develop and strengthen their muscles since they need resistance and a firm surface to push up, turn, and eventually stand up on. Toddlers will feel more comfortable with support and cushioning. With that in mind, many parents purchase a dual sided crib mattress so that they can use it in both a crib and toddler bed. 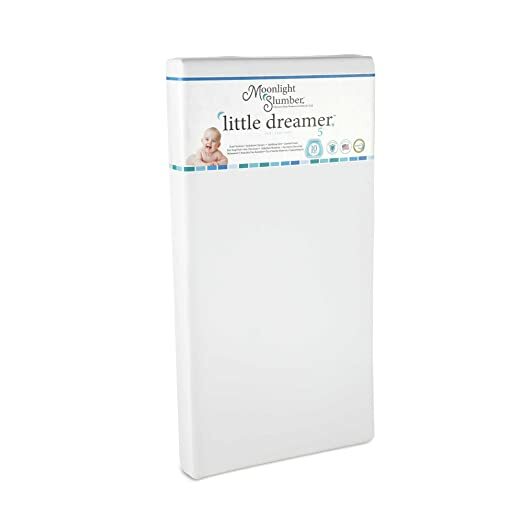 Made in the USA, the Moonlight Slumber Little Dreamer Dual Sleep Surface Crib Mattress is one of the top rated crib mattresses and is great for both infants and toddlers. You can use the extra firm foam layer for your infant or the soft plush side for your toddler. The Moonlight Slumber Little Dreamer dimensions are 27.5″ x 52″ x 5″ and weighs about 10.5 pounds. This Moonlight Slumber mattress is CertiPUR-US certified to be free of toxic flame-retardant chemicals. It is also free of PVC, vinyl, polyethylene, phthalates, and lead. The fabric used is high quality, medical grade, eco-friendly and waterproof. It has extra tight sewn seams and is bed bug and dust mite resistant. Its hypoallergenic material makes cleaning this baby mattress easy. You can simply use a damp sponge or cloth to wipe away any dirty spots. The Little Dreamer dual sided mattress has been tested rigorously for its safety and durability. This is not a cheap crib mattress, but you really do get the premium quality and safety you pay for. 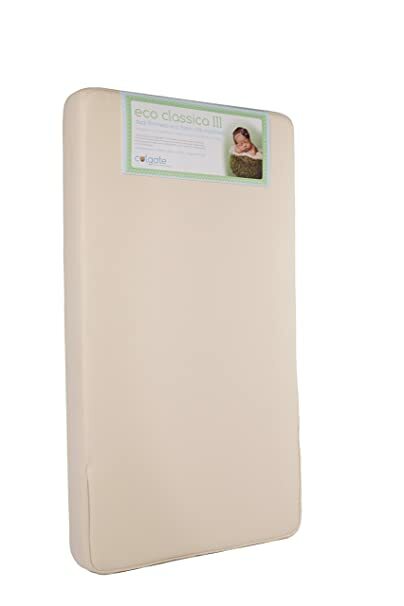 The Colgate Eco Classica III mattress is one of the best selling crib mattresses. This orthopedic style, dual firmness mattress is 6 inches thick and very lightweight, weighing only 9.6 pounds. Its dual zone design allows your infant to sleep on the firmer side and as he transitions to a toddler, you can easily flip the mattress to the softer side. The crib mattress cover is 100% certified organic cotton with a waterproof backing so that nothing gets into the mattress. The inner part of the Colgate crib mattress made of foam that is CertiPUR-US certified to be safe and high quality. The foam is also eco-friendly since they are made with plant oils instead of petroleum based oils. In addition, the Colgate mattress is GREENGUARD certified to have no harmful air emissions. It also passes all federal and state requirements for flammability and chemical composition. 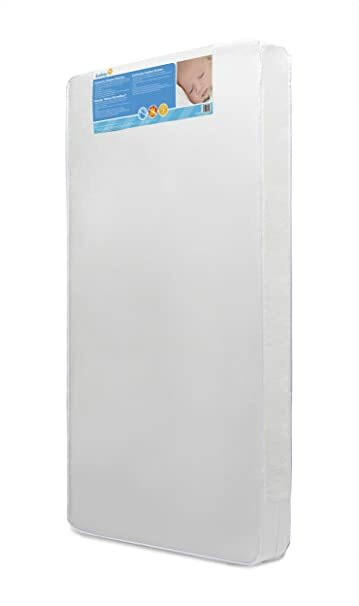 The colgate eco classica iii dimensions are 27 1/4 inch x 51 5/8 inch, which is the standard baby crib mattress size. It fits all standard size American cribs and toddler beds. All Colgate crib mattresses come with a lifetime warranty. Although it’s not a budget mattress, it’s worth that extra price and a great addition to your baby nursery. All the foam used is CertiPur-US Certified foam and is free of phthalates, mercury, PBDES, lead, formaldehyde, TDCPP or TCEP flame retardants, which may be a concern in non-certified foams. The Sealy crib mattress has been tested for chemicals to provide a healthier sleeping environment for your baby. Its lightweight yet durable soybean foam-core gives the right amount of firmness and comfort for infants and toddlers. Its cover is waterproof and stain-resistant and has lock-stitched binding, which helps to prevent liquids from seeping inside. Household allergens such as dust will wipe away instead of clinging to the mattress surface. You can easily clean this infant and toddler mattress by wiping clean with wild soap and water or a baby wipe. The Sealy crib mattress dimensions are 51.6 x 27.2 x 5 inches and its square corner design is great for a snug fit in standard cribs. The recommended age and weight limits are from birth to approximately 5 years old and up to 60 pounds. This Sealy baby mattress has been crib fit tested and passes ASTM standards (American Society for Testing and Materials Crib Mattress Standard), making it one of the safest crib mattress. It is also GREENGUARD Gold certified for indoor air quality. Sealy is one of the top mattress brands and was voted America’s Most Recommended brand for crib mattresses and pads. This Sealy baby crib mattress is not only one of the best-selling mattresses but it is also one of the most affordable mattresses. Sealy also makes baby crib mattress pads if you want to protect your mattress. Another popular Sealy mattress that you may want to consider is the Sealy Signature Prestige Posture 150 Coil Crib and Toddler Mattress. 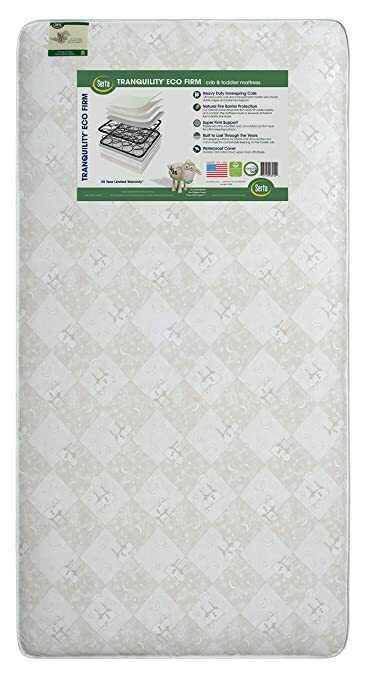 The Safety 1st Heavenly Dreams White Crib Mattress is one of the cheapest baby mattresses, often priced around $50. 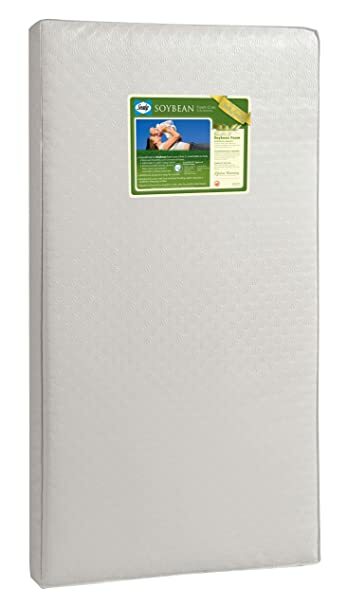 This hypoallergenic mattress is lightweight and durable so you can use it for years as your child grows. The Safety First mattress cover is vinyl and water resistant. What’s great about it is that the waterproof cover zips off, in case you ever want to wash it or change it. It is GREENGUARD Gold certified and meets standards for low chemical emissions. Although the infant mattress is free of phthalates and lead, it uses the typical polyurethane foam that some parents may want to avoid. The Safety 1st Heavenly Dreams Crib Mattress dimensions are 52.5 x 27.5 x 5.5 inches so it fits standard cribs and toddler beds. Overall, this Heavenly Dreams mattress is one of the best budget crib mattress and is a great value for the money. This Serta Tranquility eco firm crib mattress is one of the best baby mattress and is built with 120 heavy-duty innerspring coils. It is a dual sided mattress, where one side provides the right amount of firmness for infants while the other side offers a layer of natural cotton for toddlers. The Serta Tranquility crib mattress dimensions are 52″ x 27.5″ x 6″, which is the standard crib mattress size. This Serta Tranquility crib mattress has a waterproof vinyl cover which is moisture and stain resistant. It has air vents to keep it fresh. The foam used is CertiPUR-US certified and is without PBDE flame retardants, lead, mercury and other heavy metals. This infant and toddler mattress meets or exceeds phthalate, lead, flammability and CPSIA testing. It also does not contain toxic fire retardants. For a cheaper alternative, you can consider the Serta Perfect Nature Mattress. All Serta crib mattresses are GREENGUARD Gold Certified with low chemical emissions, contributing to better indoor air quality. This Naturepedic Ultra Breathable 2-Stage Organic Baby & Toddler Mattress is an organic waterproof crib mattress with a removable, breathable cover. It is a 2-stage dual firmness mattress wiith strong edge support and seamless waterproof edges. This organic crib mattress is constructed in a way that allows air to pass through the sleep surface. Even though you should put your baby to sleep on his or her back, in case he or she turns face-down, this breathable surface adds an additional layer of safety. The Naturepedic breathable baby mattress is one of the healthiest and safest baby crib mattresses on the market. 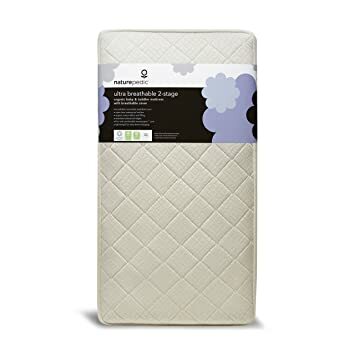 This breathable crib mattress cover features a certified luxurious organic fabric quilted to a unique 3D spacer material and is designed to maximize airflow around the baby. It protects the mattress from urine accidents, spills, and allergens. The cover is washable and easy to clean. You can use this Naturepedic baby mattress with or without its breathable cover. This way, even if you wash the baby mattress cover, your baby will still have a mattress to sleep on. This Naturepedic organic baby mattress has layers of organic cotton filling that surround the mattress core, giving it a firm yet comfortable support. It dissipates heat and moisture to reduce overheating so your baby can sleep more comfortably. Naturepedic is a GOTS certified organic mattress manufacturer and is GREENGUARD Gold certified for eliminating chemical emissions. Remember, babies need to sleep on a firm mattress for safety. They need a firm, flat and even sleeping surface so that they can breathe easily in the crib. You can read more about baby crib safety. You may also want to look into buying the best baby monitor if you want to be able to monitor your baby while he sleeps from a different room. This entry was posted in Baby Gear on November 30, 2018 by admin. This article lists some of the best cribs for 2019. Making sure your little one sleeps peacefully is very important so we have compiled a list of the best baby cribs 2019 and best baby mattress. 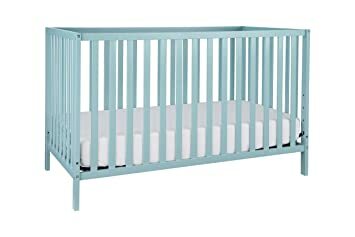 Whether you use a crib right from the start or transition your baby into a crib from a bassinet, you’ll probably use your crib for a few years, especially if your crib converts to a toddler bed and full size bed. 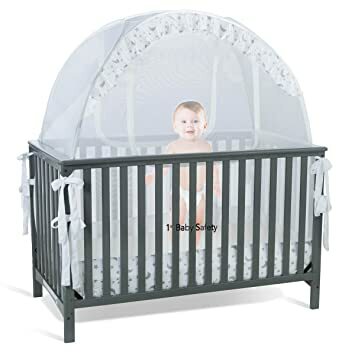 We have researched and compiled a list of the safest cribs and best baby cribs. 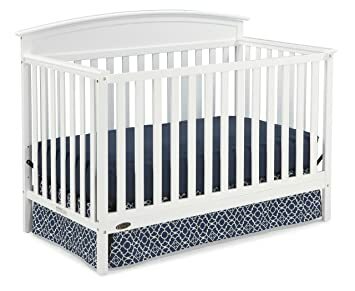 Some of the best baby crib brands include DaVinci, Stork Craft, Graco, Dream On Me, Union, Delta, Million Dollar Baby Classic, Sorelle and more. Below is a list of the top 10 best baby cribs. This DaVinci baby bed is one of the best convertible cribs, converting from an infant crib into a toddler bed with rail, daybed without rail and full-size bed. What’s nice about this DaVinci crib is that, unlike other convertible beds, it comes with the toddler rail that is needed to convert the crib into a toddler bed. The crib is sturdy, safe, and easy to assemble. It has 4 mattress height adjustment levels, perfect for growing babies. As your baby grows older, you can easily lower the mattress to minimize the risk of your baby climbing over and falling out. The Kalani crib is made out of 100% sustainable New Zealand pine wood that is non-toxic and is lead and phthalate safe. It also has a Greenguard Certification where it has been screened for 360 VOCs and over 10,000 chemical. The Kalani baby crib meets ASTM and CPSC safety standards. It is available in cherry, ebony, grey, chestnut, honey oak, white and espresso colors and comes with a 1-year warranty. The Davinici baby crib has been one of the highest-rated and best-selling cribs for over a decade. It has won many awards for its features and quality, such as from National Parenting Publications, BabyCenter and Babble. Overall, it is one best baby cribs for the money. Dream On Me baby bed can be converted into a little toddler bed and a day bed. 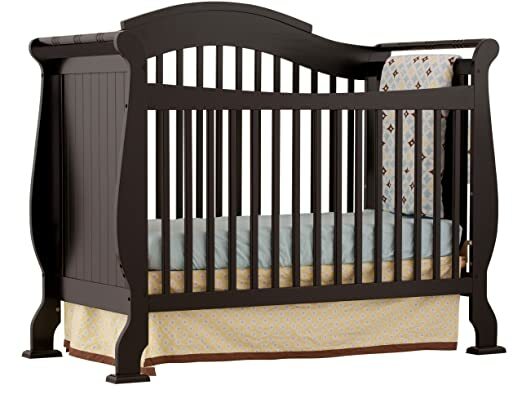 It is often sold for around $100, making it one of the best affordable cribs. It is easy to assemble and features a stationary (non drop side) rail design. 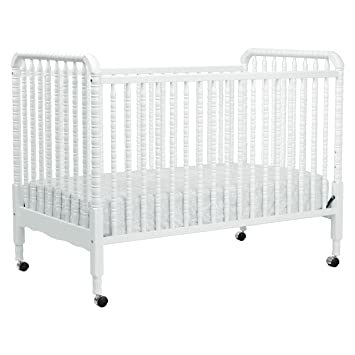 To convert the crib into a toddler bed, you will need to purchase the toddler guard rails sold separately. Then you can remove the rail to convert it to a day bed. There is a 3-position mattress support so you can move the mattress lower as your baby grows. All of Dream On Me’s products meet ASTM and CPSC safety standards. The crib is made of high quality pinewood that is free of phthalates, lead, latex and BPA. This is a lightweight crib, weighing 36 lbs. and is available in 4 different colors – cherry, espresso, natural, white. Overall, it is a great, cheap baby crib. The Stork Craft Valentia is one of the top convertible baby cribs. It converts from an infant crib to a toddler bed, daybed, and full size bed by adding bed rails. Like the DaVinci bed, this crib also comes with the toddler rail. However, you will need to purchase the bed rail separately if you want to convert it into a full size bed. There are 3 mattress-support positions for you to adjust as your baby grows and a low profile to help you get your baby in and out. 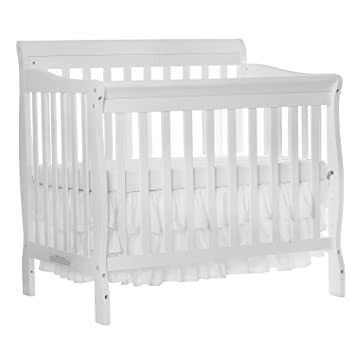 The crib’s 4 solid stationary sides are safe and stable, making it one of the safest baby cribs. 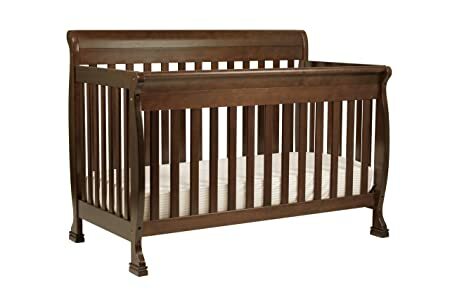 Constructed of solid wood and wood products that are non-toxic, this crib is JPMA certified and meets and/or exceeds North American and Canadian safety standards. The Valentia crib is available in white, espresso, cherry, cognac, oak, and black colors. Its curved edges and flowing lines gives it a gorgeous, royal look. This high quality Benton baby crib is made from New Zealand solid pine wood and is one of the safest cribs on the market. It meets all ASTM and CPSC safety standards and comes with a 1 year limited manufacturer’s warranty. Sorelle Tuscany is a very stylish convertible crib. You can purchase the combo set that includes the convertible crib and changer combo or just the crib itself. One of the top rated baby cribs, the Sorelle Tuscany crib converts to toddler bed, daybed, and full-size bed using conversion rails. This trendy crib is made out of solid, sturdy pine wood for your child’s safety. The Sorelle crib has 4 mattress height settings and the diaper table has 3 drawers and 3 shelves. The changing table detaches when the crib is converted into a full size bed. Both the baby crib and changing table set exceeds all U.S. consumer products safety standards. 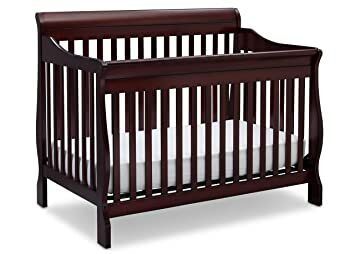 We think the white crib makes the crib look very nice and modern, but it is also available in espresso and cherry colors. This premium baby crib converts to toddler bed, daybed, and full-size bed. It comes with the toddler rail but you will need to purchase the full-size bed conversion kit separately. The sides of this Ashbury crib are very thick and sturdy. Its winged corners and curved posts give it a nice elegant look. What’s unique about this crib is that it has a spacious drawer under the crib, great for storing your baby’s essentials. This makes this crib one of the best baby cribs with storage. This Million Dollar crib has 4 adjustable mattress levels. It is made with New Zealand lead- and phthalate-safe pine wood. It meets ASTM international and US CPSC safety standards. This DaVinci infant bed converts to toddler bed and daybed. Unlike the DaVinci Kalani crib mentioned above, you need to purchase the toddler conversion kit separately. If you are going to convert it to a full size bed, you will also need to purchase the full-size bed rails. What’s cool about this bed is that it has wheels so that you can easily move it around. It also has 4 adjustable mattress positions. The crib is sturdy, safe, and easy to assemble. The Jenny Lind crib is made out of 100% sustainable New Zealand pine wood that is non-toxic and is lead and phthalate safe. It also has a Greenguard Certification where it has been screened for 360 VOCs and over 10,000 chemical. The Jenny Lind baby crib meets ASTM and CPSC safety standards. You can also purchase the DaVinci Jenny Lind Changing Table to match the Jenny baby crib. The changing pad and safety strap are included with the changing table, which features spacious, open shelves to keep diapers, lotions, wipes nearby. This is one of the best baby cribs with changing table. 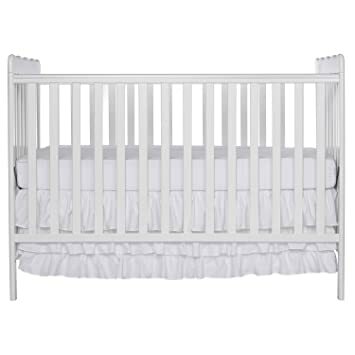 The Union convertible crib for babies is a great addition to your baby furniture. It converts to a daybed and has four adjustable mattress levels. This top rated crib is relatively lightweight and easy to assemble. There is also a Union 3-in-1 Convertible Crib that converts into a toddler bed and a day bed. The toddler conversion kit is sold separately. This crib meets ASTM international and US CPSC standards. It is made with New Zealand pine wood that is non-toxic and free of lead and phthalate. This Delta convertible crib converts to toddler bed, daybed, and full size bed with headboard and footboard. It includes the toddler and daybed guardrail but you will need to purchase the full size bed rails separately. It is easy to assemble and has 3 position mattress height adjustment. Made from strong and sturdy wood, you can get a few years out of this crib. Its non-toxic finish has been tested for lead and other toxic elements to meet or exceed CPSC and ASTM safety standards. Its timeless design makes it a great addition to your baby nursery. This versatile Delta Children crib is available in black, dark cherry, dark chocolate, and espresso cherry colors. You can also purchase the Delta Children Eclipse Changing Table to match the Canton baby crib. The changing pad and safety strap are included with the changing table, which features spacious, open shelves to keep your baby’s essentials nearby. 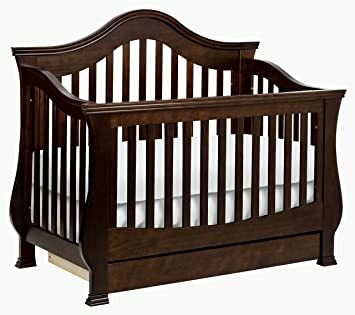 The Dream on Me Aden convertible crib is one of the top small cribs. This mini crib is smaller than standard size cribs yet has all the same benefits. It converts into a daybed and twin size bed but you will need to purchase the twin size rail and bed frame separately. The mattress support frame has 3 different height settings. It is easy to assemble and features a stationary (non drop side) rail design. The Aden crib is a sturdy, small baby crib that sits low on the floor. It weighs about 20 lbs and is available in 8 different finishes. All of Dream On Me’s products meet ASTM and CPSC safety standards. The crib is made of high quality pinewood that is free of phthalates, lead, latex and BPA. Overall, it is a great, budget-friendly crib and is a stylish piece of nursery furniture. Another useful piece of nursery furniture that you may consider is a baby crib tent (pictured below). If you are afraid of your baby climbing over the crib and falling over, you can consider purchasing this. You should not use any drop side cribs, as they do not meet federal safety standards. If you are going to be using a used crib, you should make sure it’s safe. It’s always important to be aware of crib safety. If you want to be able to monitor your baby while he sleeps from a different room, take a look at the best baby monitors 2019. 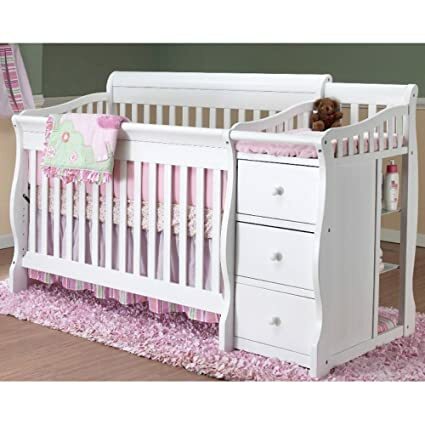 After you have read the best baby cribs reviews in an attempt to purchase the best infant crib, you will probably want to research for the top crib mattress for your baby. This entry was posted in Baby Gear on November 27, 2018 by admin.